Prairie research is underway to develop an RNAi-based fungicide to fight Fusarium head blight in wheat. Photo courtesy of Roger Larios. RNA interference, or RNAi, is emerging as an important new technology that offers the potential for targeted, environmentally friendly control of diseases and insect pests in agriculture. Now research is underway at Agriculture and Agri-Food Canada (AAFC) in Saskatoon to develop this technology as a tool for fighting crop diseases in Western Canada. Robinson explains that RNAi is a natural process involved in gene regulation. RNAi occurs in many different organisms, including animals, plants and fungi. It involves using a gene’s own DNA sequence to shut off that gene. The process can be activated by double-stranded RNA (dsRNA). RNAi technology exploits this natural phenomenon by delivering dsRNA specifically designed to silence a particular gene in a target organism. “Double-stranded RNA is a loop structure that is recognized by proteins in the cell. Then these proteins chop up the double-stranded molecule, and they use the sequence on that RNA as a template to specifically switch off genes which are complementary to that sequence,” Robinson explains. Robinson and his research team started this RNAi research program about eight months ago. Their approach involves topical applications of the dsRNA to crop plants, instead of transgenic plants genetically modified to produce the dsRNA. “So our technology is transgenic-free; there are no concerns about GMOs,” he notes. At present, the team is working on in-crop sprays. However, in the longer term, they would like to develop seed treatments so the plant would be ready to fight the pathogen right from the beginning of the plant’s life. Their current research is centring on FHB. 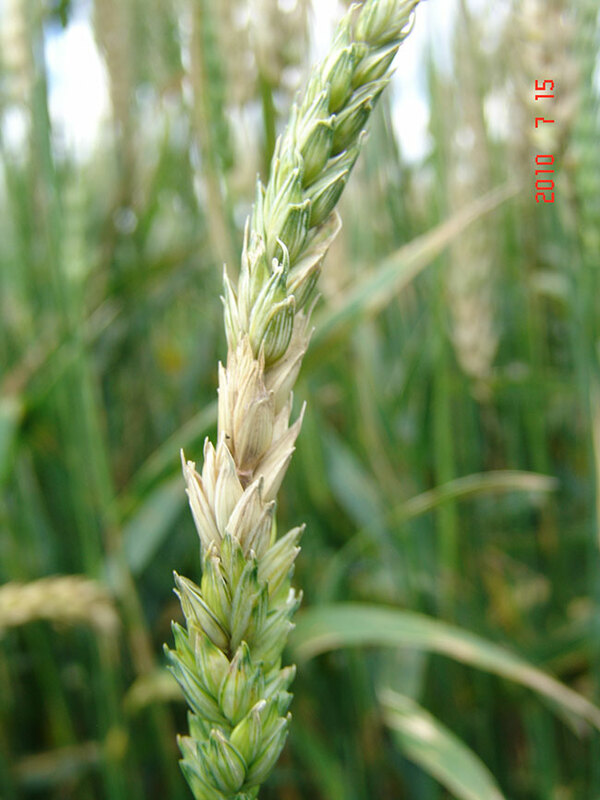 As growers know, this fungal disease can result in serious yield and grade losses and can produce toxins that limit the end-uses of the grain. Robinson explains that FHB is a good choice for alternative disease management strategies because the conventional methods don’t provide strong control of the disease. Robinson also notes, “There are reasonable chemical controls for many pathogens, but for FHB the recommended fungicides are not terribly effective. Also, you have to spray the crop at a certain developmental growth stage, and the weather conditions have to be favourable to make those treatments effective.” In addition, chemical fungicides have the potential to harm non-target organisms. 3) moving the fungicide product through the steps to commercialize it and make it available in the marketplace. The research is funded initially for three years, with support from Saskatchewan’s Agriculture Development Fund, the Western Grains Research Foundation, and the Alberta Wheat Commission. This three-year project is focusing on phase 1. Currently, Robinson and his team are selecting possible target genes in the pathogen, based on data they have been collecting over the last few years. They are choosing two types of pathogen-specific genes: genes that are highly expressed during the pathogen’s infection process; and genes that have a direct, fundamental role in the pathogen’s growth and development. For the infection-related genes, they are targeting genes involved in the production of deoxynivalenol (DON), the most common toxin associated with FHB. For the growth-related genes, they are targeting genes that are essential for the life cycle of the pathogen. “These genes are often in a single copy in the pathogen’s genome, so by shutting off that particular gene the idea is that it would be lethal to the pathogen,” he says. Robinson and his team have also begun testing their candidate genes in the lab to see which ones would be good target genes – that is, to see whether silencing these genes would kill or suppress the pathogen. The genes that affect growth are the easiest ones to see and measure, so the team started testing those ones first. Evaluating the infection-related genes will be more laborious because they will have to measure DON production. They have already found some growth genes that seem to be working as possible target genes. After Robinson and his team have identified a number of growth genes and infection genes that work as target genes, they will test combinations of the two types. “We might end up with a reduction in disease by targeting one gene, but if we target two or three at the same time, then we will see either additive or multiplicative effects by applying these molecules,” he explains. In addition, combining two pathways for attacking the pathogen in an RNAi spray formulation would make it more difficult for the pathogen to develop resistance to the spray, just like having two modes of action in a chemical product makes it harder for the pathogen to develop resistance. Also, having several different RNAi sprays that each target different genes would allow growers to rotate these products, another way to slow the development of resistance in the pathogen. For phase 2, they plan to begin by experimenting with different spray formulations. Once they have the target genes and the spray delivery working in the lab, they will start field testing. That work will involve activities like scaling up production of the dsRNA for the target genes, optimizing spray formulations, and making sure the dsRNA will last long enough to be effective against the pathogen. “Although DNA is relatively stable, RNA is relatively unstable in the environment. However, when these molecules form into that loop structure for double-stranded RNA, they are actually remarkably stable. There is evidence in the literature for dsRNA to persist for up to 30 days,” Robinson says.